Tickets are now available for the Mid Michigan Community College Foundation’s annual fundraiser – A Northern Tradition. The 13th annual event will be held from 6-9 p.m. April 27 at Jay’s Sporting Goods in Clare. This year’s commemorative print is by Kim Kleinhardt, an artist from Clare. 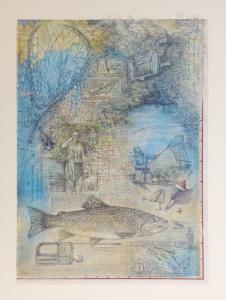 Kleinhardt’s work, a mixed media collage with fishing as its subject, will be exclusive to this event. Each ticket holder will receive a numbered and signed print that evening. A graduate of CMU and longtime art educator for Clare Public Schools, Kleinhardt has diligently worked to improve access and appreciation of the fine arts for local residents. She developed the student-run 515 Gallery in Downtown Clare as a place for her students to connect with and learn from professional artists. Kleinhardt incorporates the gallery into her art curriculum as a meaningful way to engage her students in art as a profession. Last year, more than 800 people attended A Northern Tradition, allowing the MMCC Foundation to raise nearly $110,000 for student and community advancement. More than $1.1 million has been raised by this event since it began. For a $50 ticket, each attendee receives a $25 gift certificate to Jay’s Sporting Goods, the commemorative print, and a chance to win a $1,000 gift certificate to Jay’s. About 14 area restaurants will also be serving free food, and a number of interesting demonstrators will make it an evening to remember. The Foundation’s largest program, Students of Promise, was established to promote academic achievement, cultural awareness, and higher education to academically promising middle and high school students who face significant challenges in their lives. For additional information about the 2014 A Northern Tradition, contact Cindy Mussell at (989) 386-6651.